As I write this review, I have beside me an exact-sized, museum-authorized replica of one of the kings from the Lewis chessmen. Because as I read this book, I felt I just had to have one. The Lewis chessmen are one of the most famous, and intriguing, archaeological treasures in the world. They’re surrounded by mystery – we know they were discovered on the island of Lewis in the Hebrides in 1831, but by whom, and exactly where, are the subjects of contradictory tales. They are 93 objects (one an ivory buckle), which include elements from several chess sets – including, probably, non-chess pieces. And in themselves they’re fascinating objects. Like the contemporary Icelandic sagas, they speak to us across the centuries with almost a modern voice. Each piece is a distinct individual, and their postures and gestures seem to be telling us something – though we can’t be sure we can read them across time and cultures. 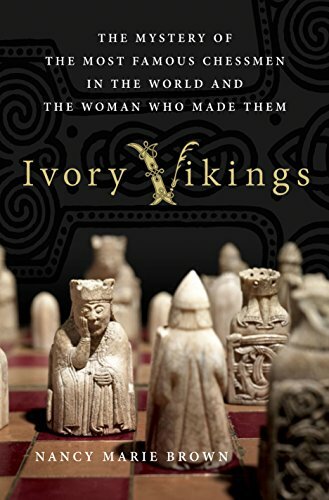 Nancy Marie Brown’s Ivory Vikings: The Mystery of the Most Famous Chessmen in the World and the Woman Who Made Them, was not exactly the book I expected from the title. And that’s good. Over the years, in my amateur historical reading, I’ve come up again and again against books that take one small piece of evidence, build a huge framework of supposition on top of it, and then declare that they have “proved” some radical new theory. This book is not like that. This is a good work of history with a somewhat grandiose title. Author Brown examines the Lewis chessmen by category – Rooks, Bishops, Queens, Kings, and Knights. First she describes the pieces, and relates how their functions changed over the centuries, and how they worked under the rules of the 12th Century (when they were probably carved). Then she relates those functions to the history of what might be called the Norwegian Sphere of Influence during the early Middle Ages. We are treated to a pretty good overview of Scandinavian/North Atlantic history in that period, with an emphasis on Iceland and Norway. Her case for Margret is not watertight, but it’s a good, plausible one, worthy of attention. And in the course of the argument, she provides us with an excellent history lesson. I enjoyed Ivory Vikings, and recommend it. I’m continuing to read (and enjoy) Nancy Marie Brown’s Ivory Vikings, about the Lewis chessmen. In spite of my enjoyment, I’m making slow progress in reading. So I have embedded the short video above to give you some background, if you’re interested. Fun fact from Brown’s book: The Lewis chessmen are the oldest we have with “bishops.” Earlier sets used other figures in that position. So they may mark a point of departure in chess history.